Here you have a NEW TEAM LOSI LOSB0240T4 4WD 1/24 SCALE ELECTRIC 4WD READY TO RUN SHORT COURSE RC ELECTRIC TRUCK !! This unit is NEW !! This package will include the Ready To Run Truck, Transmitter, Battery Pack, Charger, Owners Manual And Original Box !! 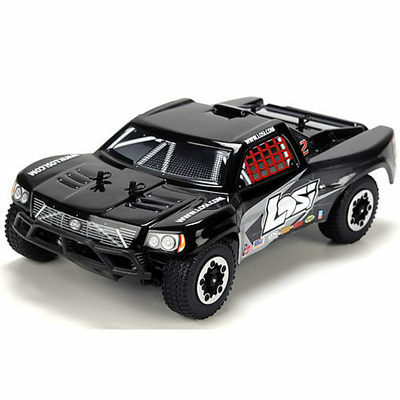 Please understand that this package includes the complete RTR Losi Truck, 27Mhz AM Transmitter, 4.8 Volt Ni-Mhi Battery Pack, Charger, Owners Manual And Original Storage Box. You can simply open box, charge and install onboard battery pack and you are up and running. You can't go wrong here when you will receive a Brand New Truck, you have a Low Purchase Price Of Only $99.00 and if you buy it now, you can receive it in just a "few days" !!! So take advantage of this limited time offer and add one of these Great Trucks To Your Fleet Now !!! This is a Brand New Teriffic Truck so Buy It Now Or Loose Out !! !!! Here is an opportunity to get one of these Great Trucks at a Great Price so Buy Now And Save !! OK, so Thank You For Looking At My Item And Please check my other "BUY IT NOW OFFERS" for More R/C Cars, Trucks, Crawlers, Helicopters, Planes, Parts, Upgrades, Accessories And Many More Great Deals !! The world's smallest 4WD short course truck.